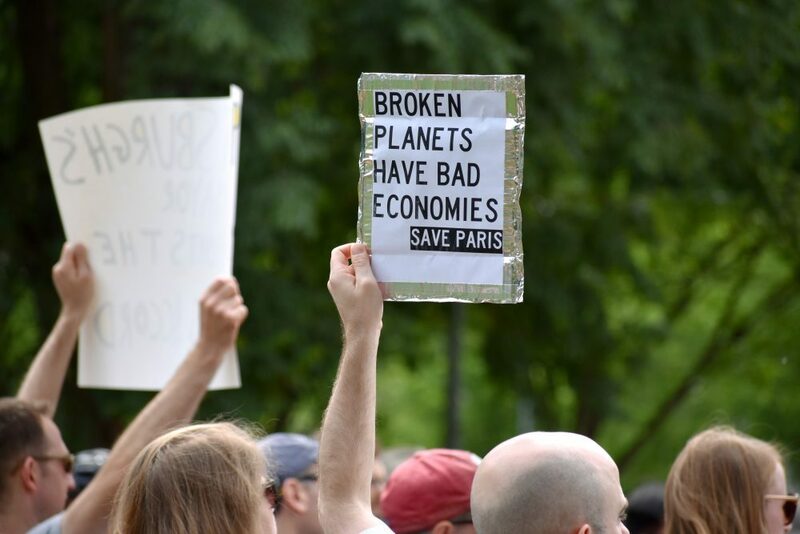 Demonstrators express support for the Paris climate accords. Image courtesy of Wikimedia Commons. The United States is out of the Paris Agreement on climate change, and the Trump administration says we will burn coal and fossil fuels if we like, and no one will tell us otherwise. But there are questions about all of these claims, especially the one about what leaving Paris might mean for the economy and jobs. The United States should get an economic boost if leaving the agreement means that it does not change its domestic environmental policy—and other countries respond by putting limits on greenhouse gas emissions in the service of fighting climate change. But that doesn’t square with the context. The United States is already in the process of changing domestic policy, and leaving Paris is only part of it. Back in March, President Trump signed executive orders instructing the Environmental Protection Agency to roll back the Clean Power Plan, a program designed to reduce greenhouse gas pollution from coal, and to review and roll back CAFE (Corporate Average Fuel Economy), standards that were designed to increase gas mileage and reduce greenhouse gas emissions from autos. Given the fossil fuel sympathies of the head of the EPA, Scott Pruitt, one can easily predict what direction these policies will take. You may like the official U.S. position on greenhouse gas emissions—that we don’t care about them much anymore—or you may not. As for me, full disclosure: I lived in the San Fernando Valley in the 1980s and worked in China in the mid-1990s, so from my personal experience I can tell you there are some things that I consume—like air—that I find better when I can’t see them. But this article is about economics, not personal preferences. We economists tend to look at both the immediate impact and the long run impact of policy. In the near term, being free of the Paris Agreement means that the elimination of anti-pollution restrictions on coal can go forward. Coal producers and coal-fired energy plants can then lower their costs by reducing the amount they have to spend on pollution abatement. Lower costs mean lower prices, and all good Econ 101 students know that when producers lower prices, consumers purchase more. That means more coal and coal-related jobs, and that is the point. But that’s only the beginning of a longer story. Modern economics traces its study of external costs (such as pollution) back to the 1960 classic “The Problem of Social Cost” by Nobel Laureate Ronald Coase. This and subsequent studies clearly show that the efficiency of a free competitive market in allocating a nation’s resources is impaired when external costs are free to the producer. The problem can be solved in one of two ways: private side payments or government intervention. An example of a side payment would be when a neighbor pays you to not use Roundup in your garden because they are trying to grow a totally organic garden just over the fence. But side payments are unusual. Thus government has a role in restoring efficiency to free markets by bringing the external cost into the producer’s cost equation. In the case of a coal mine that is polluting the nearby water supply, total cost has two elements: an internal cost paid by the consumer through the price of coal, and an external one paid by the person facing higher water prices due to increased purification costs. When coal is priced too low, as it will be with fewer regulations, too much is consumed and those purchasing water are in fact also purchasing some of this extra coal with it. Thus, unless the United States is willing to return to the table and negotiate greenhouse gas emission reductions once again (and it isn’t), then its current response is: Since you (insert your favorite miscreant country here) are not going to do more to control emissions, we are going to increase our emissions as well. Let’s all pollute together, shall we? A heavier reliance on fossil fuels, which is an old technology, impairs innovation and productivity gains. So long as it is possible to lower costs through non-taxed carbon emissions, the incentive to innovate is diminished. As with the coal mine example above, those producers who can lower costs with less regulation of emissions will end up producing more, and those who bear the additional costs, for example through additional asthma medication purchases, will end up paying for that additional production. And that means our free market system will produce too much of some goods and not enough of others. For the longer-run economic impact, it is useful to think of this change in the context of a simple economic model developed by another Nobel Laureate, Robert Solow. In the Solow framework, there are three ways to increase economic growth in the long run: capital accumulation, increased labor, and productivity gains. The great strides in per capita income in the U.S. between 1950 and 1990 were due in large part to productivity gains. At present we are in a productivity improvement drought, part of the reason that our economy has grown at only two percent per year over the last eight years. What does this have to do with Paris? It’s simple. A heavier reliance on fossil fuels, which is an old technology, impairs innovation and productivity gains. So long as it is possible to lower costs through non-taxed carbon emissions, the incentive to innovate is diminished. To be sure, there always is some incentive to innovate; it’s just that there is less now that we’ve left Paris. But the incentive to innovate remains high in the United Kingdom and the European Union, where research institutes such as The Offshore Renewable Energy Catapult and The Fraunhofer Institute continue to pursue emission abatement technology. China also is innovating, having invested $1.2 billion more than the United States in renewable energy research and development in 2015 alone. Energy innovators in Europe and China see an opportunity for their products to gain immediate market acceptance from the demand induced by their government’s actions to satisfy the Paris Agreement. But can’t U.S. innovators see the same opportunities in the Chinese and European markets? The answer is only a qualified yes. First, Trumpian trade policy introduces a great deal of uncertainty about trade relations and the ability to penetrate these markets in the future. Second, innovators have to worry about exporting to foreign markets about which they may know little. So there is a double whammy to American incentives. This means that the United States will fall behind in energy-related technology industries, and the associated employment and income growth of the future will be sacrificed to the coal mines of Appalachia. But all is not lost. California immediately rejected the withdrawal from the Paris Agreement, and as of this writing has been joined by 11 other states in the United States Climate Alliance. The Alliance members promise to uphold the Paris Agreement standards regardless of the Trump Administration’s position on them. California by itself is a $2.5 trillion economy with nearly 40 million residents. That is a big market by any standard. And, combined with the world-class universities and research institutions, the incentives lost in Coal Country might well survive on the Left Coast. That’s why California Governor Jerry Brown quickly jumped on a plane to China to affirm a partnership and co-operative position vis-à-vis the country with the most to gain from reducing carbon emissions. It seems that the Governor, along with the California legislature, recognizes the long-run stakes for economic growth and prosperity. Is this enough? Perhaps it is. Innovators in this country might find more than enough demand for their products from the 102 million people living in United States Climate Alliance states. So, regardless of one’s views on the Trump administration’s decision to exit Paris, the economics are very clear. We’ll see a misallocation of U.S. resources through induced market failure in the short term, and slower growth in the longer run—unless enough states act to effectively negate the withdrawal. In the very long run, the news might be a little better. Ultimately, the United States will go to renewable energy because of economics. Self-driving vehicles, electric vehicles, and efficient battery storage packs will eventually become cheap enough to price fossil fuels out of the market.